You Can Shoot Amazing Video Hanging Out in a Dark Parking Lot at Night. Several months ago, the organizers of the Atlanta International Night Market contacted me about creating Event Marketing videos. Since this was going to be the first event of its kind in Atlanta, they had little to no imagery to use for promotional purposes. After searching for stock footage, we put together a video which you can see here. For the next Night Market event being planned for November, we wanted to have much more footage to draw from. So I decided to shoot the first Night Market event, focusing on people, international cuisine, performances, and diversity. Now, the first Atlanta International Night Market has come and gone, and it was a big success. 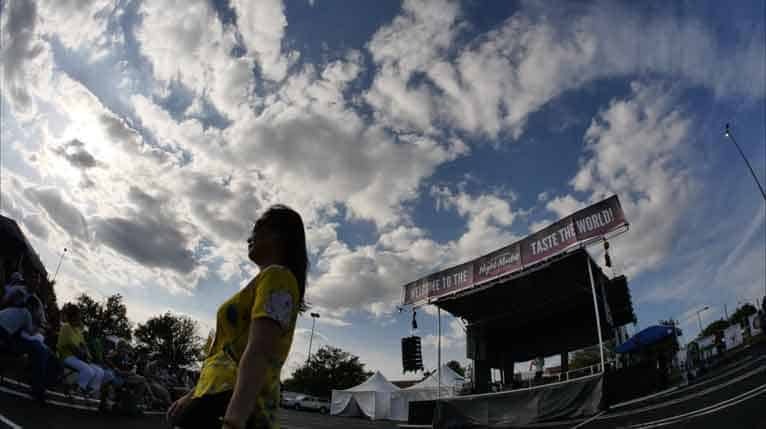 Attendance had originally been estimated at 55,000, and ended up just short of that goal—50,000 people—even though the third night of the event got rained out. The Night Market was held outdoors, in the parking lot of Gwinnett Place Mall. 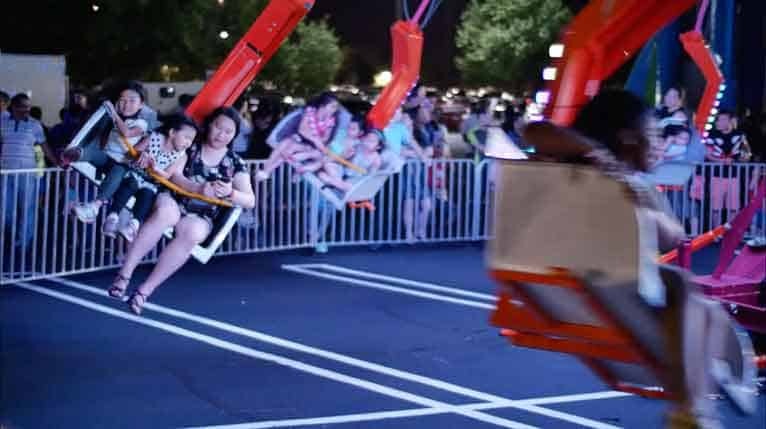 The venue was divided into sections—a large stage for musical performances, a Kids Zone with various rides and activities, and several areas for food vendors, in both booths and food trucks. Visitors were admitted starting at 5 pm—while the sun was still relatively high in the sky. To compensate for the bright light, I used neutral density filters and smaller aperture settings. Between 5 and 7 each day, I mostly shot performers on stage and time lapse shots of crowds and clouds. I also grabbed food prep shots wherever I could. Dozens of food vendors were busy preparing for the oncoming rush. To shoot the event, I used two basic camera setups. First I mounted my camera on a slider and tripod. This enabled me to control the camera motion and get smooth, fluid, lateral movement. For bigger camera moves I used a gimbal, walking around the event with steadicam smoothness. Once the sun went down, I removed the ND filters, adjusted ISO and opened up the aperture on the lenses. Light was coming from multiple sources—the food vendors, landscape lighting tinted green and blue, and brightly colored neon on the Kid Zone attractions. The low-light environment resulted in some interesting footage. 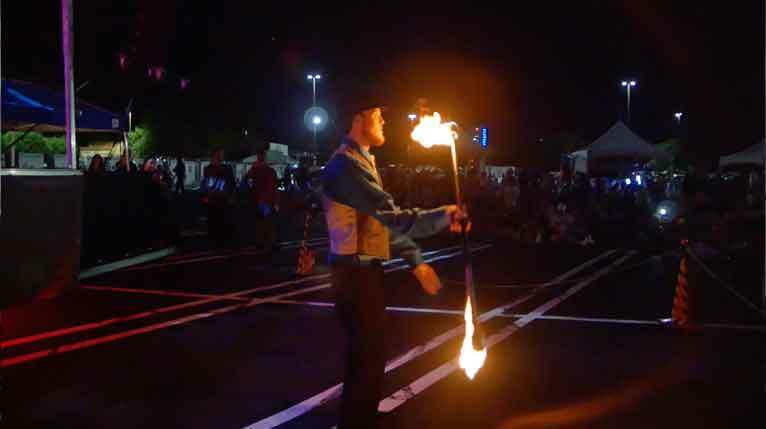 For example, the fire performers’ faces are lit mainly by the moving flames, and the musical performers by the colorful stage lighting. I shot a lot of the night footage in slow motion, giving it sort of a dreamy quality. The next Atlanta International Night Market is already being planned, for sometime in November. When the time comes to start promoting that event, we’ll have plenty of beautiful footage. Thank you once again to David Lee and David Trotter for all their hard work organizing the event.